A faculty meeting with Scott Furlong, candidate for the executive vice president for Academic Affairs position, is scheduled for today, Tuesday, February 9. The meeting begins at 4:00 p.m., in the Vectren Lecture Hall, Room 100, in Koch Center of Engineering and Science. You can view Furlong’s credentials at this website: www.evansville.edu/offices/academicaffairs/evpaaSearch.cfm. Higher Learning Commission campus visit - this month! The team will review the institution’s ongoing ability to meet the commission’s Criteria for Accreditation, standards of quality that institutions are expected to address. The Criteria emerge out of a set of guiding values that are grounded in shared tenets of the academic community. Please come out to Eykamp Hall, Room 251, Ridgway University Center, today at 7:00 p.m., to learn, taste, and talk all things soul food. The Black Student Union and UEAAA will provide traditional African American dishes for the UE community to try. BSU will also give a brief lesson on the rich history of African American cuisine. Please join us for the Speaker Series Luncheon on Wednesday, February 17, at noon in Eykamp Hall, Room 253, Ridgway University Center. This event is open to the campus community. The speaker will be John Vernasco ’84, vice president of sales at ThermoFisher Scientific. His topic will be "Unleash your Value Proposition." To reserve a free boxed lunch, please RSVP to ds120@evansville.edu by Monday, February 15, no later than noon. Assistant professor of voice and soprano Alanna Keenan will present this week’s faculty recital in Wheeler Concert Hall on Tuesday evening, February 9, at 7:30 p.m. Accompanied by professor of piano Anne Fiedler, Keenan will open the recital with an aria from Handel’s Giulio Cesare in Egitto. Other works will include Robert Schumann’s song cycle, Gedichte der Königin Maria Stuart, and five songs from Gabriel Fauré’s La chanson d’Eve. The program will conclude with modern American composer Libby Larsen’s Songs from Letters: Calamity Jane to her daughter Janey. On Saturday, soprano Sharon Fry, a student of assistant professor of voice Gregory Rike, will present her senior recital in Wheeler Concert Hall at 2:30 p.m. Fry presents the recital in partial fulfillment of the Bachelor of Music in Music Therapy degree requirements. Writing Center Boot Camp! Outlines, Introductions, and Conclusions is planned for Wednesday, February 10, 5:00 p.m., in the Writing Center. Learn to incorporate vivid language into your introductions and conclusions, and learn how outlining can help organize your thoughts and make writing essays easier. This session will also address the value of annotation. Whether you’re writing a research paper or just want to make your writing more compelling in general, it’s all about detail and organization! Join us for this useful workshop. Are you interested in helping fight against cancer? Then join us for the first Relay for Life team captain meeting of the year! Today at 7:00 p.m., there will be an informational meeting about Relay for Life in Room 117, Hyde Hall. If you or your organization would be interested in creating a team, please attend this meeting or send a representative and you could win a gift card to a local restaurant! 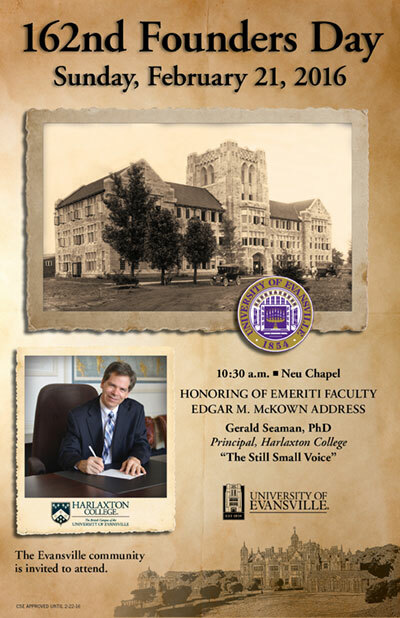 E-mail mp214@evansville.edu with any questions. Argentina will be the country featured at I-House this week! Analia Pereira will be presenting. She is a Fulbright Spanish teaching assistant. Her hobbies include singing (or any kind of performing), swimming, dancing, hanging out with friends, traveling, experiencing new adventures, etc. Her favorite part of UE is the friendliness of students, faculty, and staff; the different possibilities UE gives her to learn about the American language and culture; and the attention and importance UE gives to international students. She will be making different kinds of food from Argentina for I-House! She has a lot planned, so make sure to stop by tonight at 7:00 p.m., upstairs in Ridgway University Center! NSLS Speaker Broadcast 1 is planned for February 9, 6:00-7:00 p.m., in Eykamp Hall, Room 253, Ridgway University Center. The broadcast will feature Juju Chang, co-anchor of ABC News’ “Nightline." Everyone is invited to attend. For more information, contact Geoffrey Edwards, director for the Center for Student Engagement, at ge21@evansville.edu or ext.1102. All are welcome to join us as we celebrate our Ash Wednesday Mass today, at 5:00 p.m. in Neu Chapel. Bishop Charles Thompson will be here to celebrate with us as we begin the holy season of Lent. Beginning Wednesday, February 18, the Newman Club will be participating at the 5:30 p.m. Wednesday Masses at St. Benedict Cathedral rather than holding our regular 9:30 p.m. Wednesday night Masses. We will meet each Wednesday at 5:00 p.m. at the Newman Center before making our way to the Cathedral. Ash Wednesday is today, and will be observed on campus with Ashes to Go from 11:00 - 11:30 a.m. in Ridgway University Center, followed by a brief 12:15 p.m. Ash Wednesday Service in Neu Chapel. Ashes to Go will return to Ridgway University Center beginning at 1:00 p.m. for those who are unable to attend the service in Neu Chapel. 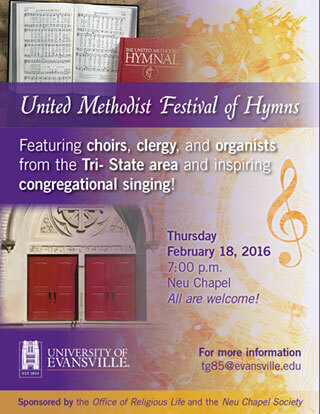 University chaplain Tamara Gieselman will be presiding over the service along with Neu Chapel organist Patrick Ritsch. In the Christian church, Ash Wednesday begins the season of Lent, a 40-day period of discipline and study prior to the Festival of the Resurrection, Easter. You are invited to be imposed upon, as you remember your mortality, while at the same time believing the good news of the Gospel. Students wishing to reside in Village Housing (Townhouses, North Hall, or other Village units) for the 2016-17 year should attend one of the scheduled information meetings. There will be information meetings today in Eykamp Hall, Room 252, Ridgway University Center. There will be two meetings (4:00 p.m. and 9:00 p.m.). For more information, see www.evansville.edu/residencelife and select the Returning Student section on the left side menu. Information meetings about selecting a residence hall room will be later in February. Join us in celebrating 40 Days of Peace! Today's action: Genuinely and honestly compliment two people. Today's quote: "The true measure of an individual is how he treats a person who can do him absolutely no good." Are you interested in exploring Asia this summer? UE offers an affordable four-week summer Asian program in Korea from June 26 to July 22. If you would like further information about the program such as credits, fees, detailed schedules, site visits, etc., please contact associate professor of political science Young Kim by e-mail at yk28@evansville.edu, or in his office in Room 53, Schroeder School of Business Building. The priority application deadline is Friday, February 19. The application is available in the Office of Education Abroad in Room 261, Schroeder School of Business Building. The UE athletic training program is looking for motivated students to pursue a master's degree in athletic training. A certified athletic trainer's job settings include, but are not limited to: high school/collegiate/professional sports, clinics and hospitals, occupational health, military, performing arts, physician extender, and more. A two-year program, starting in May, includes course work, clinical skills, and practical experience. Financial aid packages are available. For more information, go here or contact Kathy Liu, assistant professor of athletic raining and exercise and sport science, at kl154@evansville.edu. Anthony Beavers, professor of philosophy and director of the Cognitive Science Modeling Lab, just published a chapter, "The Philosophy of Technology," in The Macmillan Interdisciplinary Handbooks: A Primer on Philosophy, edited by Donald Borchert, James Petrik, and Arthur Zucker, Cengage, 2016. This book is the first of several in a series, including one on the philosophy of technology currently being edited by Beavers. Faculty and staff may pick up their two complimentary tickets for our upcoming Men's and Women's Basketball games. The men's team will take on Illinois State on Thursday, February 11, at 8:00 p.m. The women's team will take on Southern Illinois on Sunday, February 14, at 1:00 p.m.
Tickets can be picked up Monday-Friday, 8:30 a.m.-5:00 p.m., from Carson Center Athletic Ticket Office. A UE ID must be presented at the time of pickup. Please call 812-488-ACES if you have any questions.